Well TBG readers... I've been on a bit of a hiatus for a month or so... To answer your e-mails... no I am not quitting TBG... just overwhelmed with my regular life lately.. that's all. So... it's back to blogging and back to TBG we go!!! One thing that really gets me angry is seeing a mom and pop burger joint go with a frozen patty. That to me tells me they want to be a good burger joint... they just don't want to give the effort or spend the money to deliver a fresh hand packed patty to its patrons. Southwell's uses a frozen patty which probably explains the lack of Oooze. 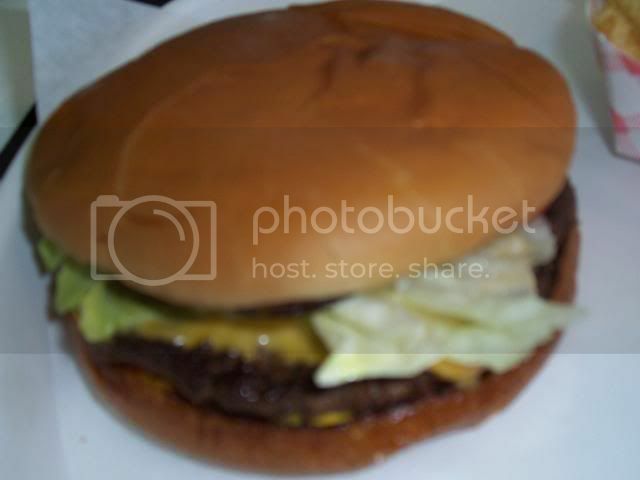 The Cheeseburger is a 1/2 pounder but it just loses so much size and quality when it is a frozen patty. 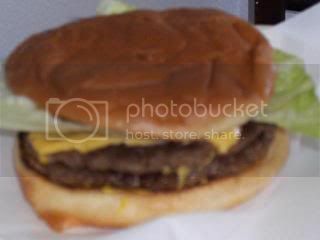 I paid 4.25 for the 1/2 pound Cheeseburger. I REALLY wish it came with fries, but it didn't. To me, 4.25 is too much. 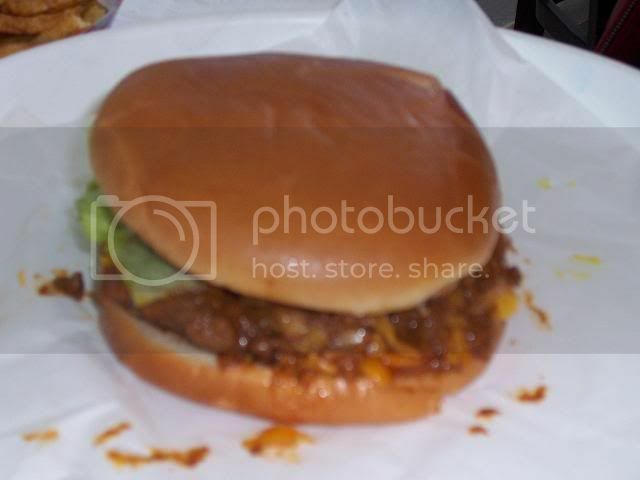 I would have happily paid 3 bucks for it but given the above mentioned problems with the burger... 4.25 seems too steep. Despite the fact that most burgers are not good for you, I didn't leave Southwell's with a desire to get myself right with God... so it must not have scared me too bad. It was far from a scary experience. 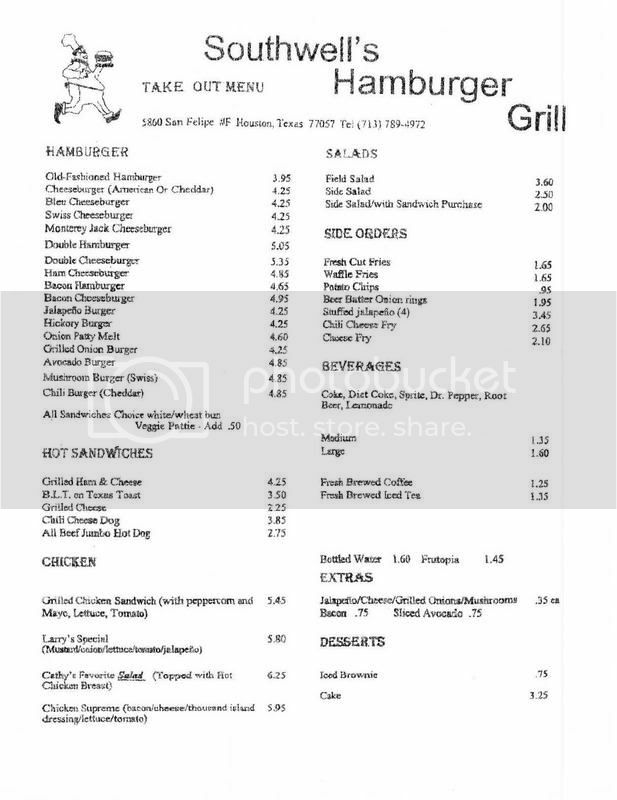 As I scanned the menu options at Southwell's, I found a few things on the menu that told me we were in the Galleria area of Houston. I wouldn't be caught dead ordering something called a "Bleu Burger" or an "Avocado Burger". There were other things on the menu that sounded good... like the chili cheese fries, beer battered onion rings, and a chili burger. It was missing some of the special names that mom and pop burger joints come up with... I am thinking of Chris Madrid's crazy names... or Tookie's Squealer. No such creativity taken here at Southwell's. My two coworkers and I ordered a good selection of the menu items. 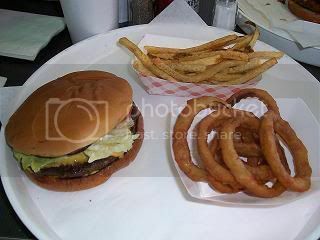 Between the three of us, we ordered the cheeseburger, double meat cheeseburger, chili burger, fresh cut fries, and beer battered onion rings. The fresh cut fries were awesome! I really love fresh cut fries. The onion rings were OK. The chili burger (see below) looked good and it was pretty messy. The double meat cheeseburger looked ok.. just a larger version of what I had ordered. All in all - the food was good... not great.... just good. From the outside, Southwell's looks like a good burger joint. It has a simple awning with its name. Nothing fancy. Inside... more of the same. Simple tables and chairs... the big menu on the back wall... it all looked so simple and plain... just the way it should be. You place your orders at the back. They take your name... they messed up my name despite me correcting them... twice. The food came pretty fast despite them being pretty busy with the lunch crowd. Overall... I won't be going out of my way to get back to Southwell's. It is a good alternative to the fast food burger joints... but it isn't a great mom and pop burger joint. Exit Loop 610 West on San Felipe. Travel west on San Felipe 3-5 miles. 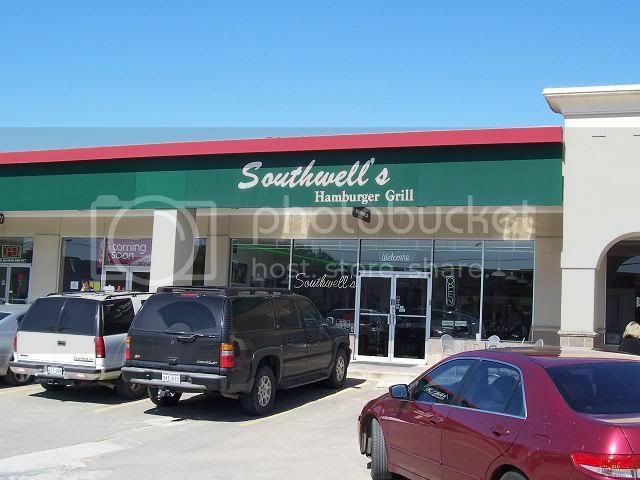 Southwell's is just pass the intersection of Augusta and San Felipe. Southwell's will be on your right. Overall... not impressed with Southwell's. It looks like a good place. I REALLY wish it had a good fresh burger. No such luck... I was disappointed. Wow! Great that you are back. 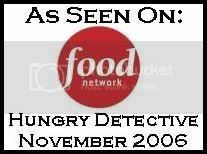 My number one source for no nonsense burger talk and review. Your rating system should be the standard for all burger reviewers everywhere. Bummer on Southwell's. Ah but they all can't be Chris Madrid. You went to Southwell's, but an awesome burger joint is right around the corner! Cliff's on Fountainview is a stone's throw away, and consistently serves up just about the best burger in Houston. Try it, and post a review please! let me know when you'll next be in the people's republic of austin ... the burger scene here is wild and dynamic!! So, just how big is a "hiatus" in Texas??? For a real treat visit Robert Smokehouse BBQ on Southmore in Pasadena, Texas. The burgers are absolutely great and the home cut fries have no equal. Although the burgers are only ok, Southwells actually has one of the best Grilled Chicken sandwiches in town. Next time try that. Two things I have to agree with the other posters on. One...Cliff's does have some great burgers. Two...The chicken sandwich at Southwell's if FANTASTIC, try that next time and you won't be disappointed. By the way, I would agree that the burgers are not the best I've ever had. The meat at Southwell's is not frozen...ever. Never. Not one time since 1986. It was likely overcooked. Frozen meat has a flavor that is unmistakeable. You should have asked for another. Email me and I will buy your next meal there. Wow, i live in England and we hardly have any good burger places apart from chain resturaunts, i'd like to visit texas and try some. Southwell's is OK - sounds like you might be in the Med Center, you should try Miller's just up the street, or my new favorite in the area, SmashBurger. No worries man, Cliff's won't let you down and it's nearby. I would be interested to see your review of the place because their burgers are awesome. Seems that you went to the one on San Felipe, which is not nearly as good as the one on Katy Fwy was, and not quite as good as the place Katy Fwy relocated to on Gaylord. As far as the meat being frozen, well, Brian isn't lying. I worked there for a year back in high school and the meat was never frozen, only fresh. Whether they changed their practices or not, I don't know for sure, but I don't suspect they have. I have no idea what you all are talking about. Southwells produces one of houstons finest hamburgers. cliffs hamburgers make me laugh. go into there kitchen and see if you would eat there again. millers is even worse and talk about a frozen patty! And smash burger nothing is fresh in that resturaunt. I lived in neighboring briargrove for 8 years and ate at Southwells so many times I couldn't put a number on it. One thing pointed out by some posters is that the chicken sandwich (peppercorn)is GREAT! I started with burgers, but soon after only ordered the chicken sandwich once I tasted it. The burgers are fine, but on the other hand, nothing to write home about either. Way better than fast food and better than Cliff's. If you want a good burger go to Papa Burger.